1. Line a baking sheet with parchment paper. Using a sharp knife, cut a ¼-inch crosshatch pattern in the skin of each breast, being careful not to pierce the meat. (Do this while the duck is cold, since it’s difficult to make such precise cuts at room temperature.) Turn the duck breasts skin-side down on the baking sheet. If the tenderloins, the smaller piece of meat that runs along the bottom of the breast, are still attached, leave them on the breasts. Use a paring knife to remove the small white tendon that runs through each tenderloin. You will see a vein that runs the length of each breast. Run your finger down the length of each vein, and if any blood comes out, wipe it away with a paper towel. 2. Season the flesh side of each breast with salt and pepper and a grating of nutmeg. Using a Microplane or other grater, grate a little orange zest over each breast. Sprinkle a few drops of vinegar over the meat. 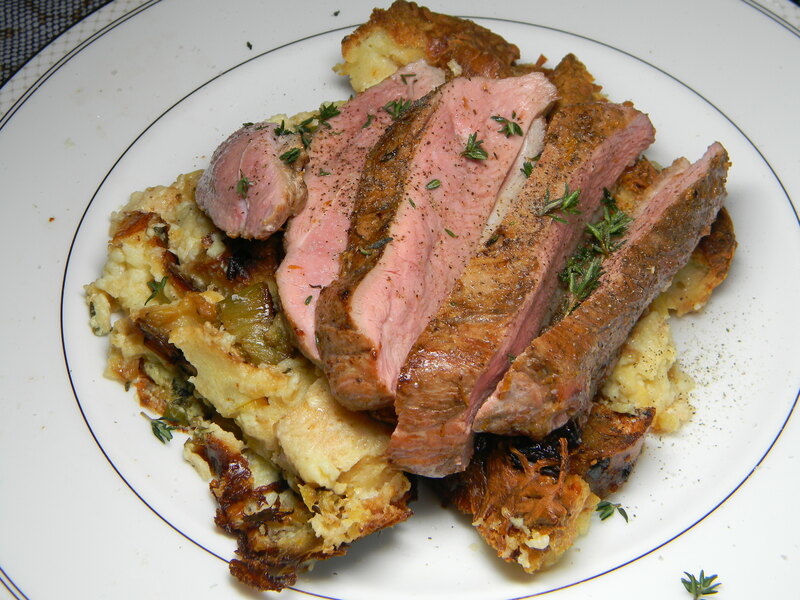 Lay a sprig of thyme running lengthwise down the center if each breast and cover with a bay leaf. Turn over and season each breast with a generous pinch of salt and a grating of nutmeg. Refrigerate, uncovered, for a least 1 hour, or up to 12 hours. 3. Preheat the oven to 400 F.
4. Set a cooling rack over a baking sheet. Set a metal bowl or other container near the stove. With a paper towel, blot any moisture from the duck breasts. Season both sides of each breast with a pinch of salt. 5. Pour some canola oil into each of the two large ovenproof frying pans over medium-low heat. (If you have only one large pan, cook the duck in 2 batches.) Add the duck skin-side-down. Move the duck breasts every few minutes to help them brown evenly. As the fat is rendered, carefully remove the excess (leaving about 1/8 inch) from each frying pan; move the pan away from the heat when you remove the fat, since if any fat hits the flame, it will cause a flare-up: tilt the pan, remove the fat with a large kitchen spoon, and transfer it to the metal bowl. Cook the duck for a total of 20 to 25 minutes, until the skin is an even rich brown and very crisp. The internal temperature of the breasts should be about 115 F. Flip each breast and just “kiss” the meat side for about 30 seconds. 7. Put the duck breast skin-side-down on the cooling rack and let rest for 5 to 10 minutes before slicing. Cut each piece of duck lengthwise into 3 -4 slices. Sprinkle the meat with gray salt and pepper. This recipe is from Thomas Keller’s Ad Hoc at Home cookbook. We found a copy online from this site. Cooking just for two, we only used two duck breasts and reduced the marinading ingredients accordingly.